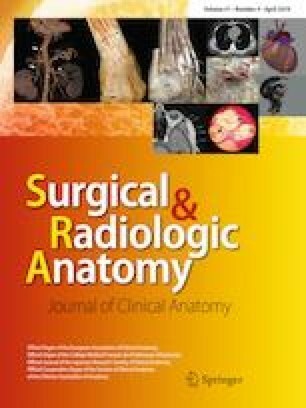 The aim was to clarify the relationships between differences in the number of fiber bundles of the anterior talofibular ligament (ATFL) and differences in the angle of the calcaneofibular ligament (CFL) with respect to the long axis of the fibula and their effects on ankle braking function. The study sample included 110 Japanese cadavers. ATFLs were categorized as: Type I with one fiber bundle; Type II with two fiber bundles with incomplete separation and complete separation; and Type III with three fiber bundles. The CFLs were categorized according to the angles of the CFLs with respect to the long axis of the fibula and the number of fiber bundles. Six categories were established: CFL10° (angle of the CFL with respect to the long axis of the fibula from 10° to 19°); CFL20° (range 20°–29°); CFL30° (range 30°–39°); CFL40° (range 40°–49°); CFL50° (range 50°–59°); and CFL2 (CFLs with two crossing fiber bundles). ATFL was Type I in 34 legs (31%), Type II in 66 legs (60%), and Type III in 10 legs (9%). Five CFL categories were identified: CFL10° in 4 feet (3.7%); CFL20° in 23 feet (20.9%); CFL30° in 34 feet (30.9%); CFL40° in 33 feet (30%); CFL50° in 15 feet (13.6%); and CFL2 in one foot (0.9%). Type III contained mainly CFL40° and CFL50° (7 of 10 feet). ATFL and CFL appear to cooperate in the ankle joint braking function. The data sets generated during and/or analysed during the current study are available from the corresponding author on reasonable request.